The Homestead Cottages / B&B in Yosemite National Park, Ahwahnee California region. 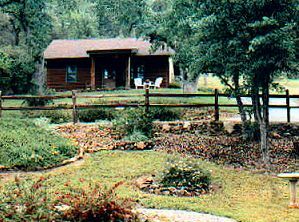 The Homestead Cottages on 160 wooded acres stand in harmony with the ancient oaks. Natural gardens, meandering rock walls and clear blue skies lull you into the slower pace of a mountain retreat. Each cottage features a comfortable living room, romantic bedroom, spacious bathroom and country kitchen. Kitchens are stocked daily during maid service with coffees, teas, juice, muffins, granola and fruit. Located just 10 minutes from Oakhurst which is host to quaint shops, fine dining, and local plays. This and other Yosemite area Bed and Breakfast Inns can be found here online in The Register.